Fairfield, NJ – Fairfield, NJ – MG America, the U.S. subsidiary of MG2 Bologna, Italy, a leading supplier of processing and packaging equipment, has expanded its filling division through a recently formalized strategic partnership with filling and closing solutions provider COMAS of Florence, Italy. Founded in 1979, COMAS has provided more than 1,500 filling and closing solutions to customers across several countries and most continents. COMAS has delivered over 70 machines to the U.S. and North America, and is now aligning with MG America to meet the continued market demand. 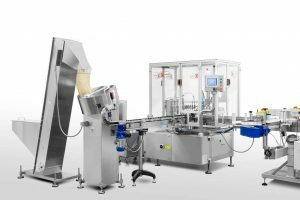 MG America will supply COMAS machinery solutions for non-sterile applications for the pharma, nutraceutical and cosmetic market segments, assuming responsibility for all sales, project management and customer service/support. COMAS enjoys a worldwide reputation for extremely robust and durable machinery tailor-made for frequent use with minimal maintenance requirements. The company’s reliable designs incorporate the latest electronic process controls and software systems to meet a wide variety of application speeds, I/O demands and data management necessities.